How do you solve this problem? Well, you can use Double checked locking idiom, which you learn in this article. Btw, if you are curious about why Singleton is considered anti-pattern, I highly recommend the book Games Programming Patterns by Robert Nystrom, though examples are in C++, it's one of the most readable books on design pattern, you won't feel bored or cheated. 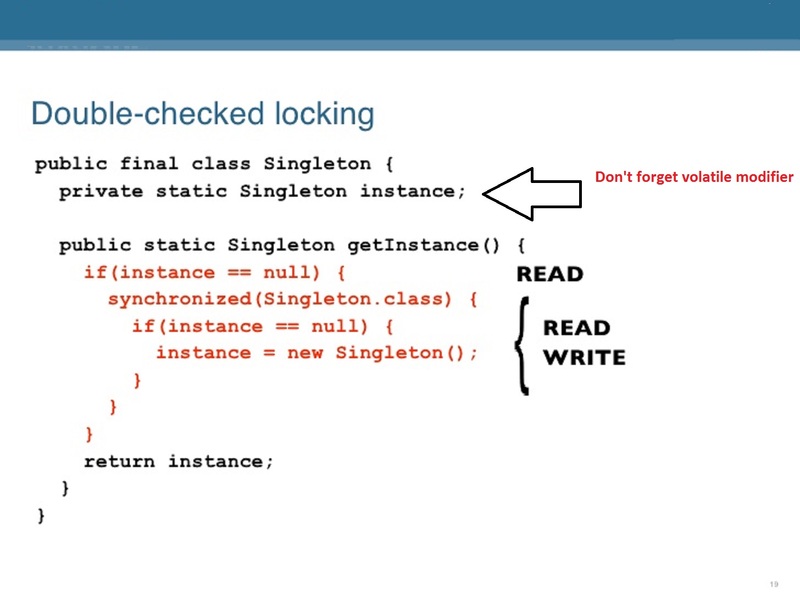 Double checked locking idiom solves this problem by allowing you to eat your cake and have it as well, it ensures synchronization is used only when instance of Singleton is created, when getInstance() method is called first time and all other time, same instance is returned without any synchronization overhead. As the name suggests, it's double-checked, which means it checked two times whether _instnace (the singleton instance) is initialized or not, one without synchronization and other with synchronization. This double check ensures that locking is only used when an instance is null i.e. when first time someone calls getInstance(), all subsequent call will see _instnace not null hence they will not enter into synchronization block. 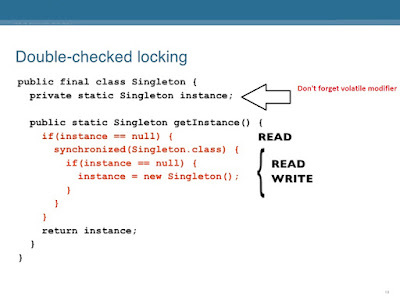 * Thread Safe Singleton in Java using Double checked locking. To illustrate the point, how this idiom prevents from two instances being created when two thread simultaneously calls the getInstance() method, let's see the theory. Suppose, thread T1 calls getInstance() very the first time and sees that _instance is null then it will go inside synchronization block and that point of time it paused. Now, thread T2 calls getInstance() and it will also see _instance variable null, but it cannot go inside synchronization block because the lock is held by Thread T1, which is inside the synchronization block. Now, thread T1 wake up and creates a new instance of singleton and come out of synchronized block. After this when thread T2 goes inside synchronized block, it again checks whether _instance is null and this time check fails because _instnace is no more null. So thread T2 come out of the synchronized block without creating another instance. Further calls to this method return from first check only. By the way, double checked locking idiom was broken before Java 5. It was possible for a thread to see half initialized instance which will fail the first null check, resulting in returning a half-initialized Singleton. That's why it's absolutely critical to make _instnace a volatile variable. The Java memory model updates and happens-before makes double checked locking works again. That's all about how to create thread-safe Singleton in Java, but this is not the only way to create the thread-safe singleton. You can use Enum as Singleton then Java itself will guarantee that only one instance will be created even in the case of multiple threads trying to access it the same time. Alternatively, you can also eagerly initialized the Singleton, in that case, it would be initialized on static initializer block at the time of class loading in a thread-safe manner. If you decide to use double-checked locking idiom to make Singleton creation thread-safe, don't forget the volatile modifier. If you want to learn more about safe publication techniques in concurrency and other concurrency gotchas, read Java Concurrency in Practice by Brian Goetz, one of the most respected book on Java concurrency. And, if you want to read more about design patterns, particular about Singleton pattern with examples from game development, try Game design patterns by Robert Nystrom, one of the interesting book I read this year. Hi Javin - your class in not final so can be extended and modified.Also what about reflection breaking this singleton?